Question 1. Answer the following questions. Q(i) . what is an ecosystem? Answer. The system formed by the interaction between living organisms themselves and between living and their surroundings is called an ecosystem. (ii)Question. What do you mean by natural environment? Answer. All those things which are naturally existing around us are together called natural environment. Q(iii). 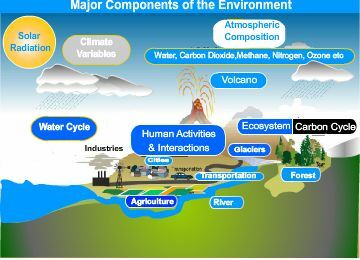 Which are major components of the environment? 3. Activities and interactions of human beings. Q(iv). Give four examples of human made environment ? Answer. Bridges, Parks, Road, Buildings, etc are example of human-made environment. Q(v). Question. What is lithosphere? Answer. Lithosphere is the hard top layer of the earth. Q(vi). Whish are the two major components of biotic environment? Answer.Plants and animals are two major components of biotic environment. Q(vii) Question What is biosphere? 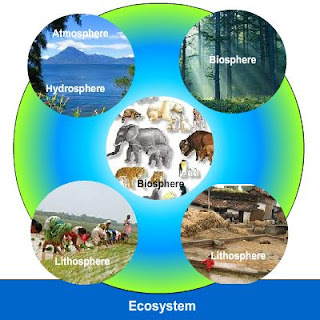 Answer.. Biosphere it is the narrow zone of the earth where land, water and air support life by interacting with each other is called biosphere. Question 2. Tick the correct answer. Q(i) Which is not a natural environment. (a) Desert. (b) Aquarium. (c) Forest. Q(ii) Which is not a component of human environment. (a) Land. (b) Religion. (c) Community. Q(iii) Which is a human made environment. (a)Mountain. (b) Sea. (c) Road. Q(iv) Which is a threat to environment. 1 Biosphere. (a) blanket of air which surrounds the earth. 2 Atmosphere. (b) domain of water. 3 Hydrosphere. (c) our surrounds. 4 Environment. (d) narrow zone where land, water and air interact. 1 Biosphere. (d) narrow zone where land, water and air interact. 2 Atmosphere. (a) blanket of air which surrounds the earth..
3 Hydrosphere. (b) domain of water. 4 Environment. (c) our surrounds. (i) Man modifies his environment? Answer.Man modifies his environment to meet his various needs. For example, he clears forests for obtaining land for agriculture and for making shelter. He extrracts minerals from the earth for making various things. He makes dams for producing electricity.These ae a few of the ways in which man modifies his environment. (ii) Plants and animals depen on each other. Answer.Animals, whether carnivores or herbivores,ultimately depend on plants for their food. Also,plants provide fresh oxygen to animals to breath in. These keep the environment clean and provide sheter to a number of animals on the other hand, animals provide carbon dioxide which plants use for making their food. Dead and decaying matter animals provide nutrients ro plants to help them grow. Imagine an ideal environment where you would love to live. Draw a picture of your ideal environment? logical & rational evaluation of the chapter...it has been covered nicely. the answer of question no.2(ii) is wrong...it should be Land! The answer of ques 2 ii part is wrong , the answer is a part land.